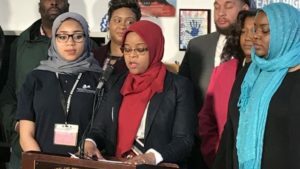 When a local high school student was benched during a playoff game because she would not remove her hijab, her constitutional right to express her religious beliefs was violated. But this outrageous decision by the referee didn’t just violate the rights of 16 year-old Nashihah Thompson-King, an honor student at Mastery Charter School. It was a statement of institutional intolerance that put the future sports participation of every girl who wears hijab at risk. Sports participation is critically important to teenage girls. It provides much needed physical activity that helps lower their risk for chronic diseases including diabetes, breast cancer, heart disease, and osteoporosis. Rates of teen pregnancy, smoking, drug use, and depression all decrease when teens participate in sports. And sports gives girls opportunities for sheer joy that are too often missing from our inner cities. Dr. William Hite, the School District of Philadelphia’s superintendent has even requested that the PIAA league adopt a rule to immediately end the requirement for a waiver for religious exemption as it does not provide any competitive advance or risk of injury. At Get Healthy Philly, we refuse to accept that any girl should be denied the opportunity to play a sport she loves because of her religion. We are committed to a future in which every child in Philadelphia can be healthy and active and focus on breaking new grounds for our future. Nashihah: we stand with you.